The ongoing saga of non-K Intel Skylake overclocking continues today, as Asrock is about to implement another workaround. Asrock released BIOS updates towards the end of last year that allowed users to overclock Intel's newest generation of processors despite it being restricted on non-K branded processors. Other manufacturers followed suit, until Intel put a stop to it last month. 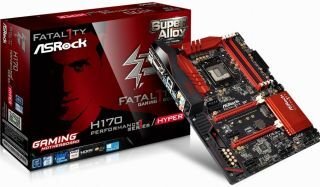 According to Tech Power Up, Asrock has announced the Fatal1ty H170 Gaming K4 Hyper and the Fatal1ty B150 Gaming K4 Hyper motherboards, which use an external clock-generator chip that give cadence to the CPU which circumvents Intel's on-die clock-generator. Basically, this means you'll be able to overclock non-K Skylakes again, increasing the base clock frequency in increments of 0.0625MHz, and you'll be able to change the memory clock too. Many Z-series motherboards feature external clock generators, but this is the first time we've seen them on H- and B-series boards, which typically don't support overclocking. In terms of specification, these two motherboards are basically the same as the existing H170 and B150 Asrock boards.